Anil Ambani-led Reliance Communication claimed on Monday it paid Rs 533 crore (Rs 5.33 billion) as interconnection charges to Bharat Sanchar Nigam Limited and termed its disconnection by BSNL from its network as a 'breach of agreement'. BSNL had disconnected the point of interconnection of Reliance Communications on May 23 and May 31 in Haryana and on May 4 in Punjab claiming non-payment of pending dues by the private telco. PoI is a system in which a telecom operator provides its network to other telecom operators for routing of calls for a a fee. "RCom has made a payment of Rs 533 crore towards full and final settlement towards Interconnection with BSNL. In addition to the above, payment of Rs 55 crore (Rs 550 million) has also been made under protest," RCom said. The payment has been made against the 'arbitrary threats of PoI disconnection' at various times for various circles to protect the interests of the mobile customers across the country, it added. Points of interconnection form the fundamental basis of interconnect pact on access deficit charges between telecom operators. "RCom has been complying with TDSAT rulings in this matter. 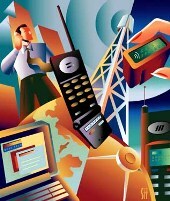 In April 2011, BSNL raised fresh ADC-related demands for the period February-November 2004," RCom said. RCom said BSNL has also raised additional interest invoices for the period between November 14, 2004 and February 28, 2006. It added that disconnecting PoI under these circumstances is an effective breach of the terms of existing Interconnect Agreement between any two operators as well as 'against the basic ethics of telecom services'. "BSNL is following unprofessional practices and using coercive tactics against other telecom operators to force settlements of legal and financial disputes," it said. However, this practice has also affected BSNL's own 4.18 million customers as well as the total of 8.14 million customers in the two circles, RCom added. RCom said it has proposed to BSNL for the final settlement of all pan-India ADC payment disputes for the period November 14, 2004 to February 28, 2006.